This is a very unique gatte ki sabzi, unique because it does not have yogurt gravy ! My mother makes it in onion gravy and its tastes delicious. My onion gravy doesn't comes out as good as hers, so added small amount of tomatoes and voilà, it tastes amazing. Pinch lemon sized balls from the dough and roll it between your palms to make it cylindrical, like a log. Boil water in a pan and pour the gatte logs and let it boil for 5-7 minutes (do not throw the water). Heat oil and add cumin seeds, asafoetida and let the seeds crackle. Saute sliced onions, followed byginger garlic paste and tomatoes. Add all the dry spices. Add water in which gattes were boiled (around 3 cups). Boil the gravy and add gattes and cook covered on low heat for another 15-20 minutes. You can add some fresh or dry fenugreek leaves to the gattes for distinctive flavor. I make this sabji exactly the same way :-) Yumm!!! Yumm - looks very good!! Gatte ki sabji is looking so tasty that I cannot stop myself eating that. 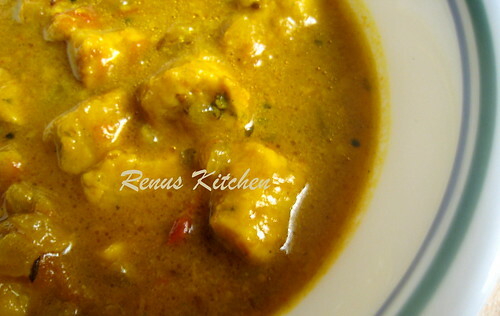 Though I do not prefer to eat gatte ki sabji, but this is looking so tasty.